I bought this cabin as a second home when I lived in Atlanta. After I retired, I bought a home in nearby Marble, on 24 acres. I decided to keep the cabin as rental property. I wanted to enjoy the creek, hot tub, and other unique qualities of the property and also share it with others. It is still my favorite place to go to enjoy nature and relax. Murphy is close to many areas of interest and is easily accessible year-round by auto, private plane or motorcycle. This beautiful, peaceful area, situated in the Nantahala Region of the Great Smokey Mountains, is unique in its rich history, serenity and beauty. This area is a well-kept secret and a very special place to visit. You can dig your own worms and enjoy Trout fishing in the back yard (wading boots and fishing poles at cabin). Grill your catch just feet away from the creek and eat your catch on the covered deck next to the creek. Then relax in the large hot tub by the creek or sit around a camp-fire and roast marshmallows. You can splash in the creek and pan for gold (supplies available at cabin). Two full baths. One off Master bedroom and one in hallway just outside of the 2nd bedroom. Downtown Murphy is only 8.5 miles from the cabin. Murphy is a quaint town, rich in history. Harrah's Cherokee Valley River Casino. Upscale fast food, full restaurant, and bowling alley in addition to many video poker machines, video games, and table games. Located in a rural area, 8.5 miles from Murphy. Surrounded by mountains. There are 3 other cabins in the area. Location is quiet and peaceful, but not secluded. 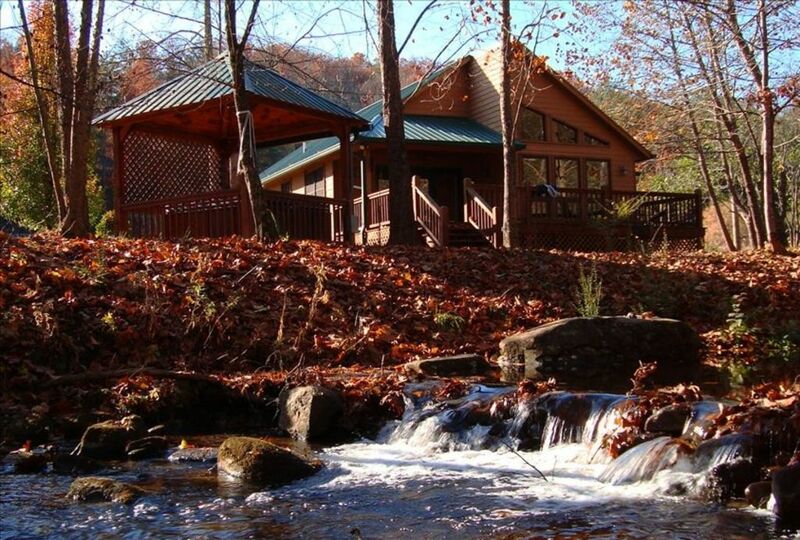 Cabin is located in a valley, surrounded by the Great Smokey Mountains. Just feet from Davis Creek, a rushing Trout stream. Fully stocked with pots, pans, and small appliances including an electric grill, crock pot, and ice cream maker. This property features a shallow walkway along the creek. Fire pit, telescope, board games, supplies and instructions to pan for gold and semi-precious stones, fishing poles and wading boots supplied. Complementary coffee, condiments, basic cooking supplies, electric indoor grill, ice cream maker, plus much, much more. Peace is something we all long for.The simple pleasure of sitting on the deck listening to a babbling stream watching cows slowing eating their grass and occasional hearing a trout jumping out of the water. This type of peace is not for everyone but it's what my family was looking for. My Hubby has Alzheimer so the peace was greatly appreciated. Everything we needed was thought of and provided. It was like having a good friend that knew you so well that all your wants and needs were provided for ! We hope to return.1!! Beautiful cabin on a creek. Not far from Murphy. The cabin was beautiful, charming, well stocked and spotless! Belinda was extremely helpful and accommodating. While you do have neighbors, the cabin is set next to a creek and woods. This is my first rental experience and I loved it. The cabin had more amenities than my home. There were coffee, creamer and condiments there to use—which gave it a warm welcoming touch. I would definitely go back again. The cabin is as described and more. Comfortable, cozy, and the landscape is so peaceful. Can’t wait for our next stay. Whitewater Rafting, world-class Motorcycling and a Casino! Rates are subject to change until reservation is confirmed. (We do not charge by the night, but by the length of the stay. Initial rates listed before inquiry are only accurate for 3 and 7 night stays. Do not book until you have made an inquiry and received an accurate quotation from the owner.) Off-Season rates do not apply during holiday periods. Minimum stay of 5 nights during holiday periods.